Design Style Guide Valentine Giveaway – 10 Winners! Design Style Guide is having a Valentine Giveaway with 10 – yes 10 – different winners!! 10 shop owners have all offered to supply FREE gift certificates (and FREE shipping) for each of our shops! !Â These certificates are worth between $20 and $30 orÂ for a specific item or for YOUR choice in a shop – so well worth your time! It is very simple to enter – read the blog post for details. For each of 10 days, there will be a winner! This is a free giveaway and I encourage you to join in and see if you can win! !Â The Giveaway is through February 13 – so join in today!! Each day from now until then another winner is chosen! !Â The details about the giveaway on the Design Style Blog are included at this first link at the top of this post.Â You know my art – I encourage to go join in the giveaway. Here are my shops Diane’s Etsy shop and Diane’s 1000 Markets Shop and Diane’s ArtFire Shop. This is a great opportunity and let’s hope one of you wins! The winner will be announced on February 15 – so be sure to leave a comment by February 14. Thank YOU for stopping by and reading my blog. Thank YOU for stopping by and reading my blog. Design Style Holidays Giveaway – Still Time! Design Style Guide is having a Holiday Giveaway with 13 – yes 13 – different winners!! 12 shop owners have all offered to supply FREE gift certificates (and FREE shipping) for each of our shops! !Â These certificates are worth between $15 and $40 – so well worth your time! It is very simple to enter – read the blog post for details. For each of 12 Days of Christmas, there will be a winner – and then a bonus gift! You can win a FREE $20 gift certificate to any of 3 of my shops … with FREE shipping and handling. I am the free giveaway for day 7. For those who like my art, I hope you will take advantage of this free giveaway! !Â I am also willing to list another image if you win and your favorite isn’t there. This is a free giveaway and I encourage you to join in and see if you can win! !Â The Giveaway is through December 24 – so join in today!! Each day from now until then another winner is chosen! !Â Here are the details about the giveaway on the Design Style Blog.Â You know my art – I encourage to go join in the giveaway. Here are my shops Diane’s Etsy shop and Diane’s 1000 Markets Shop and Diane’s ArtFire Shop. This is a great opportunity and let’s hope one of you wins! Please take a look at my shops and see which one YOU want to take home!! Thank you! Susan Elkin and I each have a Zazzle shop – Susan is http://zazzle.com/SusanElkin* and mine is http://zazzle.com/DianeClancyArt*.Â I hope you enjoy seeing what we have created … and maybe you will mosey along to check out our shops.Â Thank you! 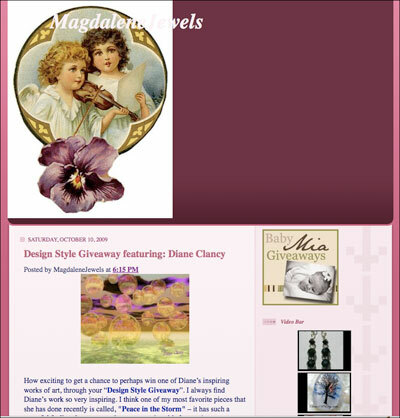 Here are my other shops Diane’s Etsy shop and Diane’s 1000 Markets Shop, Diane’s ArtFire Shop and Diane’s CafePress Shop. This is a great opportunity and let’s hope one of you wins! Please take a look at my shops and see what YOU want to take home!! Thank you! Design Style Guide Holiday Giveaway – 12 Winners! Design Style Guide is having a Holiday Giveaway with 12 – yes 12 – different winners!! 12 shop owners have all offered to supply FREE gift certificates (and FREE shipping) for each of our shops! !Â These certificates are worth between $15 and $40 – so well worth your time! It is very simple to enter – read the blog post for details. For each of 12 Days of Christmas, there will be a winner! DSG FREE Giveaway – Featuring Me! They are having a series of giveaways – the current one with Diane Clancy (yes, ME!!) at Etsy and 1000 Markets.Â This is a free giveaway and I encourage you to join in and see if you can win! !Â The Giveaway is through October 20 – so join in today! !Â Here are the details about the giveaway on the Design Style Blog.Â You know my art – I encourage to go join in the giveaway. Here are my shops Diane’s Etsy shop and Diane’s 1000 Markets Shop. This is a great opportunity and let’s hope one of you wins!